Did anyone besides me watch the new Lifetime show, "Supermarket Superstar"? I did! It is a food competition but I like it because the judges give great feedback on whether a product can be sold in grocery stores. One of the competitors made alcoholic cupcakes which I think are great, but who wants to get carded at a grocery store for an $9 mini cake? Boozy, cocktail-inspired cupcakes are a great trend for parties, weddings, events for adults; however the grocery store may not the best market for these cupcakes. This morning I spotted this refreshing cupcake made with Limoncello, filled with lemon fruit filling and topped with a Limoncello buttercream. 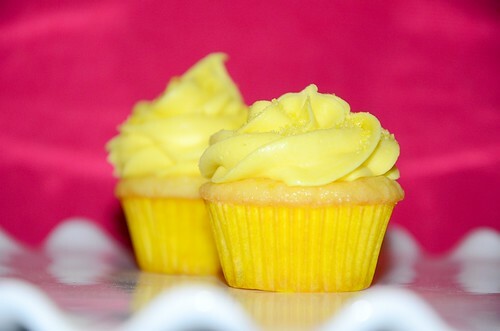 It is finished with Lemon sugar sprinkles and made by Samantha of Bootlegger Cupcakes.